Margaret Mary "Pegi" Young (née Morton; December 1, 1952 – January 1, 2019) was an American singer, songwriter, environmentalist, educator and philanthropist. After marrying Canadian folk rock musician Neil Young in 1978, her debut as a singer came in 1983 when she was a member of The Pinkettes, the backing vocalists on her husband's rockabilly Shocking Pinks tour. In 1994 she made her first nationwide TV appearance at the Academy Awards, singing backup on Neil's song "Philadelphia", nominated for an Oscar. In 2007, after recording songs in her home studio at the Broken Arrow Ranch, she released her self-titled debut album. Young followed it with the albums Foul Deeds (2010), and Bracing for Impact (2011). She toured and performed with her band The Survivors, which includes Spooner Oldham on piano, Rick Rosas on bass, Kelvin Holly on guitar and drummer Phil Jones. In 1986, Pegi Young co-founded the Bridge School, an educational program aimed at serving the needs of children with severe physical and speech impairments. Young founded the school with additional help from Jim Forderer, a fellow parent of a child with specialized educational needs, and Dr. Marilyn Buzolich. Pegi and Neil raised awareness for their newly founded school with their Bridge School Benefit Concert, which ran annually from 1986 until 2016, bringing in musicians such as Arcade Fire, Mumford & Sons, Tony Bennett, Lucinda Williams, Jack White and Metallica. Since 1986, The Bridge School has continued to grow and evolve organically into an internationally recognized organization. Graduates from The Bridge School have often returned to their home school districts and continued their education once their rudimentary educational needs were met in the Bridge School’s more specialized setting. She served in the capacity of Executive Director of the Bridge School for seven years, and as President of the Board of Directors since its inception in 1986 until her death. She also continued to organize and host the Bridge School Benefit concert every year since its 1986 debut. Young served on the board of A.R.T. (Artistic Realization Technologies), an organization dedicated to bringing avenues for creative expression through art into the lives of individuals with severe disabilities. She was on the Advisory Board of the “virtual” AAC-RERC and on the Advisory Council for Lemelson Assistive Technology and Design Center on the campus of Hampshire College. Young served for four years on the board of the Alliance for Technology Access, a grassroots organization of 43 community based centers around the country serving individuals with disabilities, aimed at increasing their independence through the use of technology. Young performed at and hosted Farm Aid with her then-husband Neil in 2007 and in 2012, and, in 2013, began serving on the board of directors of Rainforest Connection, an organization aimed at preventing deforestation by using real-time data collection to maximize the effectiveness of ground enforcement. Young was born Margaret Mary Morton in San Mateo, California, on December 1, 1952 to Thomas and Margaret Jean (Foley) Morton. Young met future husband Neil Young in 1974 when she was working as a waitress at a diner near his ranch, a story he tells in the 1992 song "Unknown Legend". They married in August 1978 and had two children, Ben and Amber, in addition to her becoming stepmother to his first child, Zeke. Both Ben and Zeke are diagnosed with cerebral palsy, and Amber with epilepsy. In July 2014, Neil filed for divorce in California. Young died of cancer on January 1, 2019, aged 66, in Mountain View, California—just a few miles south of her birthplace in the San Francisco Bay Area. ^ a b c d e f Ferguson, John (2013-03-17). "At 60, Pegi Young Is Just Tuning Up". LNP. Retrieved 2019-01-03. ^ a b c d Staff writers (2012-11-14). "Pegi Young Braces For Impact". The Austin Chronicle. Retrieved 2019-01-03. ^ a b c d Carr, David (2012-09-19). "Neil Young Comes Clean". The New York Times Magazine. Retrieved 2019-01-03. ^ a b c d "The Bridge School - History". Bridge School. Retrieved 2019-01-03. ^ Stern, Kenneth A. "Is Cerebral Palsy Genetic, Congenital, or Acquired?". MyChild. Stern Law, PLLC. Retrieved 2019-01-03. ^ a b c Gonulsen, Jason (2007-09-10). "Pegi Young Unknown Legend". Glide Magazine. Retrieved 2019-01-03. ^ a b MTV News Staff (1999-02-24). "Wyclef Jean, Neil Young, Beck, Stevie Wonder, George Clinton Celebrate 1999 Rock The Vote! Awards". MTV News. Retrieved November 28, 2014. ^ a b Schlansky, Evan (2011-10-21). "Pegi Young Talks New Album". American Songwriter. Retrieved 2019-01-05. ^ Giles, Jeff (2012-10-16). "2012 Bridge School Benefit Concert to be Available as Online Pay-Per-View". Ultimate Classic Rock. Retrieved 2019-01-05. ^ "Bridge School Today". The Bridge School. Retrieved 2019-01-05. ^ Vigeant, Fred (2013-05-31). "Pegi and Neil Young's Concert for the Bridge School". WITF. Retrieved 2019-01-05. ^ Knapp, Krystal (2009-08-03). "A.R.T. provides creative tools for disabled". Artistic Realization Technologies. Retrieved 2019-01-05. ^ "Helping Organizations Make their Communications Available to the Disabled". W. K. Kellogg Foundation. 2004-02-04. Retrieved 2019-01-05. ^ Staff writers (2012-07-09). "Farm Aid Coming to Hershey, PA". CMT. Retrieved 2019-01-05. ^ "Sugar Mountain Neil Young Set Lists". Sugarmtn.org. Retrieved November 28, 2014. ^ Ferguson, Cat (2013-06-05). "Old smartphones called in to save Indonesian forests". New Scientist. Retrieved 2019-01-05. ^ Grenoble, Ryan (2013-06-11). "'Rainforest Connection' Aims To Use Cell Phones To Stop Deforestation". HuffPost. Retrieved 2019-01-03. ^ Lewis, Randy (August 27, 2014). "Neil Young, wife Pegi divorcing; she was inspiration for many songs". Los Angeles Times. Retrieved November 1, 2018. ^ a b Sandomir, Richard (2019-01-04). "Pegi Young, 66, Musician Who Started a School for Disabled, Dies". The New York Times. Retrieved 2019-01-05. ^ Reges, Margaret. 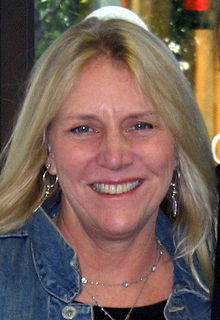 "Pegi Young Biography". AllMusic.com. Retrieved November 1, 2018. ^ Forani, Jonathan (2014-08-26). "Neil Young to divorce wife of 36 years". Toronto Star. Retrieved 2019-01-05. ^ "Ten nominees for Women's Hall of Fame". sfgate.com. Retrieved January 5, 2019. ^ "Neil Receives Patrick Lippert Award from the Rock The Vote Organization". Hyperrust.org. Retrieved January 3, 2019. This page was last edited on 4 April 2019, at 01:46 (UTC).